This really hit the spot! Every week, I make tacos for my boyfriend for â€œTaco Tuesday,â€ so this week I decided to have a taco in a bowl form, so I wouldn't be so jelous of his taco plate ;) Will be making this a weekly ritual... DELISH and just 8 ingredients! 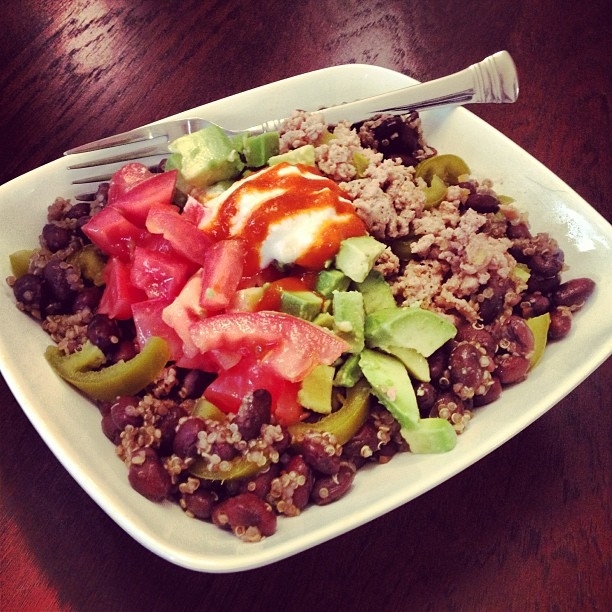 Cook ground turkey, cook quinoa, then mix quinoa, black beans, and jalapenos together and warm stove top. Add bean/quinoa mix to bottom of bowl. Place ground turkey on top. Dice avocado and tomato, then add that to top. I topped off with a little nonfat plain greek yogurt and Sriracha.